The Louvre is one of the most famous museums in the world both for the impressive quality of its collection and for the iconic Louvre Pyramid that bridges the exterior and the interior of the museum. Designed and installed in 1989 by architect I. M. Pei, the Louvre Pyramid will be disappearing after 27 years of dazzling tourists. Except, of course, that it wasn't really be going anywhere. 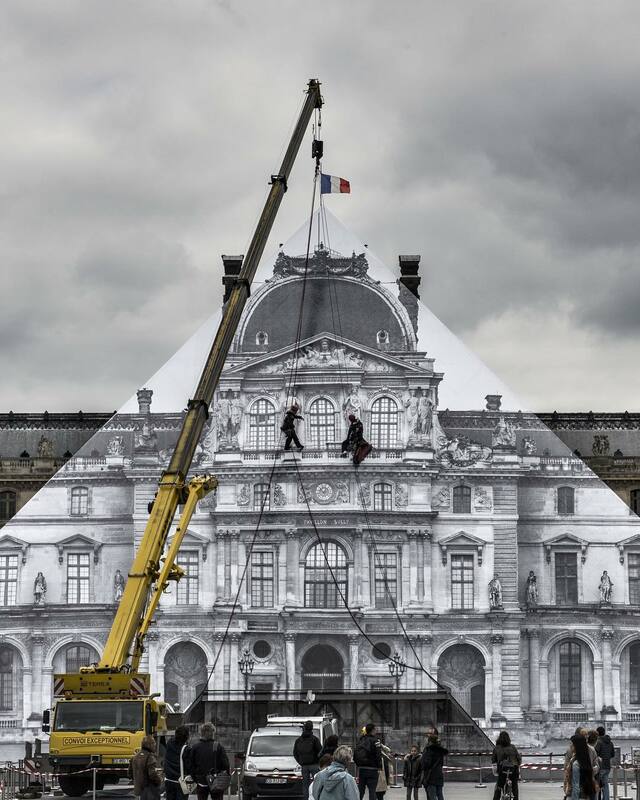 Instead, the famous street artist and TED Prize winner JR wrapped each of the glass sections of the pyramid with a huge black and white image of the original Louvre building. When viewed correctly, the photo on the pyramid would align perfectly with the rest of the building, making it seem to disappear. Unfortunately, though, the exhibit only ran for the month of June and has now been taken down, so apologies on not letting you know while you still had the chance to see it. After all, who doesn't love a good excuse to go to Paris in the summer? JR grew to fame for his large-scale photos in black and white that appeared surreptitiously in very public places, but this time around, he had the blessing from the Louvre itself. "By erasing the Louvre Pyramid, I am highlighting the way Pei made the Louvre relevant for his time, while bringing the Louvre back to its original state. The Pyramid is one of the most photographed French monuments. I am re-directing its energy, because people are going to have to move around it. They are going to look for the best angle to get the full impact of the anamorphic image, and really make the Pyramid disappear." While you can't see the piece in person anymore, you can still marvel at the effect thanks to the Instagram pictures of the piece, as well as any number of images that have been carefully planned to properly recreate the illusion. From the press release (in French, translated via Google, so apologies for any errors, Francophones! ): "JR’s works leave no one indifferent because they are watching, deep within ourselves. His dramatic intervention fashion highlights the question of the role of images in the era of globalization and their multicast, the intimate sphere to mass use. Today prompted by “the greatest museum in the world”, JR sets his sights on one of its symbols, the Louvre Pyramid, to subject it to an anamorphic surprise."